Whole30 is gaining in popularity and for good reason! Whole30 places emphasis on wholesome foods that are good for you. Having a Whole30 meal plan makes it much easier to stick to it! Whole30 places emphasis on wholesome foods that are good for you, while also eliminating potentially problematic foods from the diet. There is research and evidence that suggests certain foods are more likely to be allergies or problems for certain people, and Whole30 aims to eradicate that problem! When you have a Whole30 meal plan, it makes it so much easier to follow. Whole30 asks that you stick to the program in its entirety for 30 whole days – no cheats, no slip ups or you’ll have to start from day one again! Whole30 does take a lot more meal planning and effort as you’ll have to find foods that are specifically Whole30 compliant and a Whole30 meal plan that works for you. This Whole30 meal plan is great for all people looking to do a Whole30 – whether it’s your first round or your tenth round! The recipes are delicious and easy to make – making this the perfect Whole30 meal plan for even the busiest of people! If you find that you’re running out of time during the week and can’t make a specific breakfast on a specific day, rather than falling off the wagon and cheating – consider having some hard-boiled eggs on hand that you can eat throughout the week as a quick breakfast or snack. For lunches, throw together a quick mason jar salad and make sure to be prepared. The worst thing you can do is to cheat on a Whole30 because you’re only cheating yourself out of the results you deserve! If you find that dinner is the hardest time to manage for you, consider adding a few more crockpot recipes into your recipe rotation. You can also find the full rules of the Whole30 plan on their site. Lastly, you’ll notice that many of the recipes on the Whole30 meal plan are marked with an asterisk. This means you can find the recipes here in this post for easy access as they’re all linked below in order. Simply save and print the meal plan and bookmark or pin all the recipes for easy reference! Please note that some of these recipes look like they include items that are not Whole30 approved, like bacon, almond milk and such. You can read ways to get even those items so they are Whole30 approved. What sounds most delicious on this Whole30 meal plan? Let me know in the comments below! 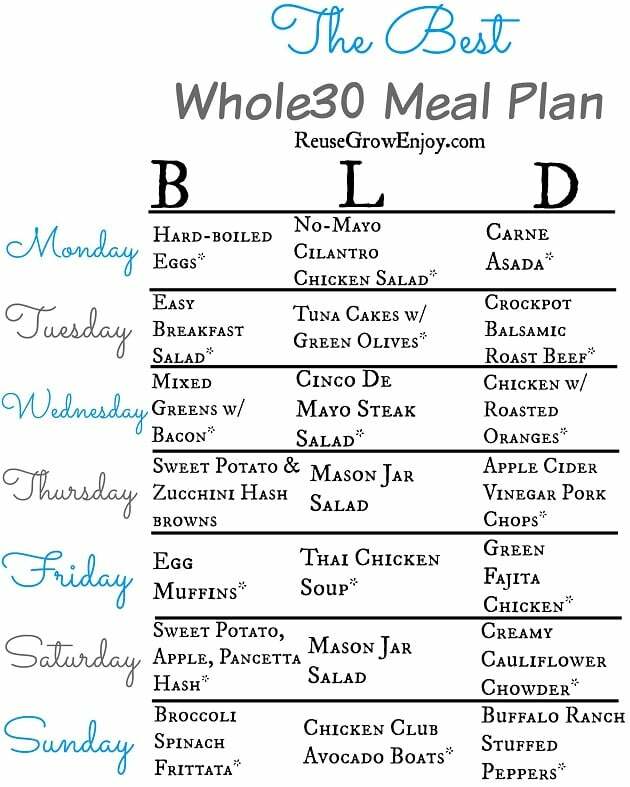 If you are looking for even more ideas, check out my new Whole30 Menu Plan For A Week. Hi Jo Ann, eating healthy is important for anyone and not just those with weight issues. Most of my recipes you will find on this site are a low price to make. I try to keep it that way because I know I don’t like spending a ton on a meal and feel others would feel the same.